Episode 12 Mission 2 Please Help!! I've been trying to beat episode 12 mission 2 for almost a week. I've tried different weapon combinations, upgraded, etc. And I still cannot defeat these bastards. Any advice/suggestions would be a great help. I am assuming the "normal" mission and not the Hard or Nightmare... I used an Assault, Hunter, and Shooter combo (I record the team I used so I can go with that combo again in the future). I'm a big fan of my ranged weapons team. I think I was level 17 with all of my crew at that time with level 17/18 gear. If you search YouTube, you can also find some great videos of people completing the missions. Good luck! I tend to favor the long range weapons as well. I've upgraded and equipped the corresponding legendary equipment. I also watched the available videos on youtube. However, in the video there are half the amount of "walkers " than in the actual game. I keep getting over run! @Alixandra, good luck with 12-2. 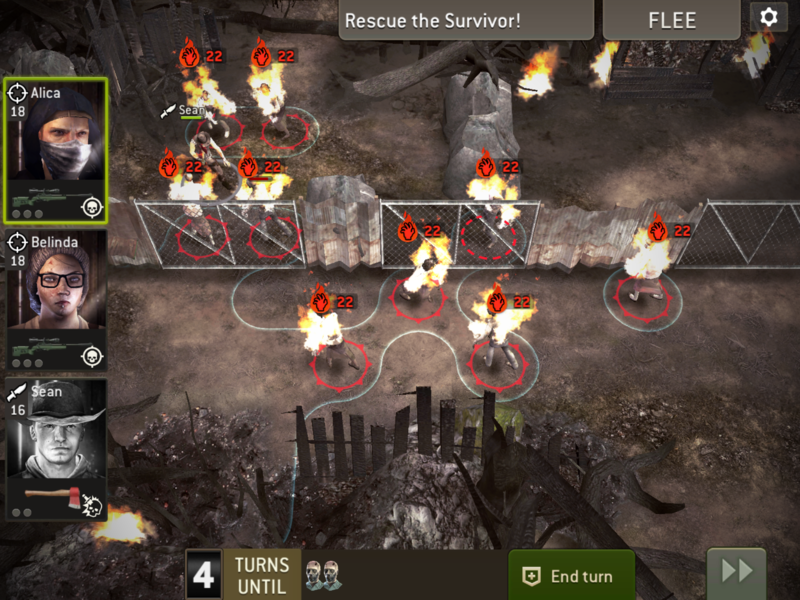 Once you beat it, your reward will be story mission 12-3 which is even harder because you only get to take 2 survivors and you have to rescue a feeble scout from flaming walkers and fatties. @Alixandra, I guess I could have offered some advice. I agree that there are WAY more walkers now than appear in those old videos. You have to stack your hunters on the left side of the screen and get two shots into a row of walkers, especially the fatties. Make sure to use your charge power every time you can. Also allow your shooter to get the first two kill shots so he can take two shots at the fatties. You can substitute an assualt for a hunter if you don't have two high quality hunters but you need your best shooter who should have your highest damage level for the fatties. Be patient at first and inch your way toward the exit as the herd allows. Don't get discouraged if it takes a while to complete it. The good news is overall I feel story mission 13 is a bit easier than mission 12. Just finished it on Nightmare using two hunters and a shooter. Use the shooter to move the bin and do it as soon as possible. Hammer away from a distance then move to the exit.